New Kingston duo Days are Done live at Hands Coffee Co, Kingston. 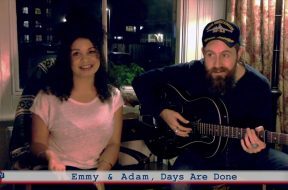 Find out more at https://youtube.com/daysaredoneofficial Directed by G Morton via https://edinglis.com/ New indie folk blues duo Days Are Done perform 'Nightblind' live from their studio in Kingston. Download Nightblind from their debut EP 'Live at Hands Coffee Co Vol I' https://geo.itunes.apple.com/gb/album... https://www.facebook.com/wearedaysare... Lyrics Don’t go raising that white flag again You left your ninth life at the door This wild hurricane, this force of you Been there before Don’t go lining up your gun again Cause I outdrew you once before Heres all I ever learned of love from you - Nothing at all Got my hands tied I’m Nightblind again Visions of you / will tear us all to shreds Got my heart stopped My heart stopped / dead This is not a duet Are we done with this yet? We float away On blues and greys And down we fall Oh got my hands tied I’m Nightblind again Visions of you / will tear us all to shreds Got my heart stopped My heart stopped / dead This is not a duet Are we done with this yet? Got my hands tied I’m Nightblind again Visions of you / will tear us all to shreds Got my heart stopped My heart stopped / dead This is not a duet Are we done with this yet? This is not a duet Are we done with this yet? This is not a duet Are we done with this Yet?